A group dedicated to Old School gaming, with a particular reference the miniatures and games produced by Games Workshop in the 1980s and early 1990s. Our favourite games include (but are not limited to) Warhammer First, Second and Third editions, Rogue Trader, Heroquest, Advanced Heroquest, Space Hulk, Blood Bowl, Talisman, etc. ONLY Vintage Citadel Miniatures from 1970s to early 1990s and art inspired by the fantasy and scifi wargaming of that period. When submitting please be sure to submit to the right folder. Members can submit up to 3 submissions a day. All submissions are subject to admin approval, please don't be offended if the submission is declined. This guy has lots of nice pics of old imperial guard and stuff, go in and help add some of it to the group! cant believe the last 25 yrs passed so fast. Thanks for accepting me into the group and allowing me to share my model buildings and stuff with other gamers. And I'd like to take this opportunity to say how impressed (and envious of) I am by the incredible painting skills of the other members of this group. They have inspired me to produce more work in this genre. You are welcome. I suggested your Hero Quest buildings on the italian Hero Quest forum, they were really impressed Well Done! Oh wow! Many thanks for spreading the word, and I'm pleased they accepted them favourably. I'm trying to get other people to join and create something usable in this style. The dream is to one day have an expensive layout that anyone can access for free and "play God" with. So far I've not had a terrific response to my appeal, but I'll keep plugging away at this until I get a few people on board. Thank you for featuring my work! 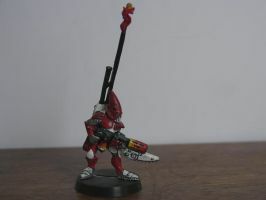 I modified the second one to have a shuriken pistol instead of a las pistol (since Eldar don't use Las tech). 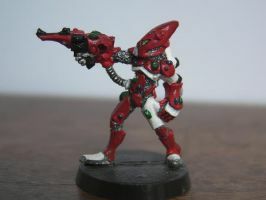 Sure, Eldar use las-tech and marines carry shuriken pistols. this. is. oldhammaaar!! You're correct, it is classified as Rogue. It must have came out at the tail end of Rogue Trader/beginning of 40K.